Getting healthy isn’t always easy, but it doesn’t have to be SO hard. Get on-demand support, the cure for “not enough time” and the mindset fix to achieve food confidence for life. Think of it as having a private nutritionist in your back pocket. Join the waitlist below to get notified when registration opens. What is Nourish for Life? Nourish for Life is NOT about information overload, food restriction, or me telling you what you ‘should’ be eating. What it IS about is learning what’s possible for you, in your life, for your health (as YOU define it). There’s no single answer that works for everyone, because that’s not how it works. True food confidence is eating in a way that feels good in your unique and beautiful body. Nourish for Life is a group coaching program that gives you on-demand support & nutrition know-how for those everyday moments that keep you stuck. 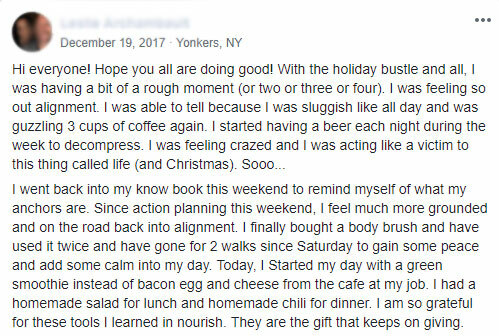 As your coach, I am there to help you IN THE MOMENT to get out of overwhelm and back into alignment so you can feel clear, confident, and excited about your food choices. This program is a culmination of my knowledge and decades of experience in nutrition counseling, lifestyle coaching, and nutrition education. basically anytime you need help making the right choices, I’ll be your very own wing-woman. And if you do fall off the horse (it’s bound to happen – nobody eats perfectly, all the time — nor should they! ), I’ll be there to help pick you up, share my knowledge, and give you a big ol’ heave-ho to get you back up on the horse again. No excuses, no slipping back into old habits — just the perfect blend of encouragement, advice, and accountability so you can see it through (and know exactly what to do next time). how to create a healthier life PERFECTLY designed for YOU? Look, I get it, I do. Not having enough time, support, or nutrition know-how to reach your health and wellness goals can seriously affect your level of commitment and motivation over time. And here’s the thing, all those fad diets and programs that promise you the world (in just 6 weeks!)? 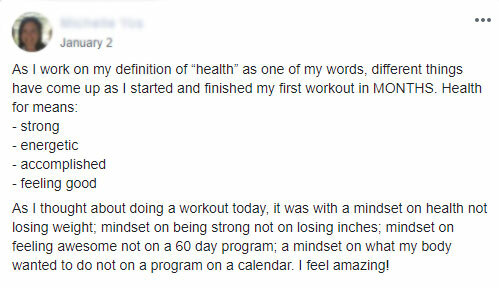 Because you can’t fix a lifetime of one mindset around food in just 6 weeks. That’s not how your brain works. You need implementation time! You need time to succeed and fail a few times to understand what’s behind your food choices. And it sure does help to have an amazing group of supportive women (and me!) on call, who always have your back. Getting off the diet roller coaster and creating a healthy eating style that feels natural and effortless is possible. I’ve helped thousands of women eager to move towards a healthier way of life. But they always get stuck at the same point. Why did this tend to happen? Because they take an all or nothing approach. They were falling back into the restriction/overeat cycle, and they were racked with guilt about it. Here’s the thing: I don’t do guilt. I don’t do perfect. In fact, you might like to know I love French fries and mint chocolate chip ice cream! I created Nourish for Life so that you can take an honest look at your life and see for yourself that it’s not about perfection, rather it’s about learning how to incorporate food and lifestyle choices in a way that’s right for YOU. SO YES, IT’S ALL ABOUT YOU! AND WHAT WORKS FOR YOUR UNIQUE BODY AND LIFESTYLE. Nourish for Life works because we’re in it together. And I’m 100% committed to helping you achieve your goals. When you join Nourish for Life you’ll have guest admission to the Winter, Spring and Fall sessions of my 21-Day Nourish programs in 2019! Get access to hundreds of healthy, Nourish-inspired recipes to help make creating delicious meals! Each month you’ll receive a fully downloadable digital cookbook filled with delicious recipes to help make planning healthy meals breakfast, lunch and dinner planning a breeze. 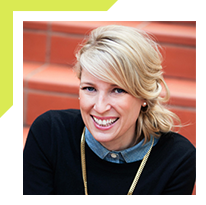 Stay in alignment throughout the program with weekly audio coaching from Danielle – straight to your inbox. The Nourish For Life “podcast” will provide a weekly dose of food for thought, inspiration and motivation to keep you on track and focused on your goals. Listen anywhere and anytime you need a quick dose of Nourish wisdom. During the program you will create your own custom Nourish for Life Blueprint, a proven, step by step process designed to create new habits and lasting change around food, your mindset, how you eat and all the inner-work necessary for lifelong health. Live group coaching calls each month to ask questions and gain support from me and the group. On these group calls we will go deeper into our monthly challenge discussions, talk through eating strategies for upcoming life events, or discuss any area you’re struggling with. These calls are 100% for you! You’ll be assigned a partner in the group for weekly check-ins, support, and a little extra accountability outside the online forum (optional). You will access all the learning modules, handouts and action sheets in one beautiful easy to access online home. This is where you’ll find the real GOLD of the program. You’ll get to know a wonderful community of women who will support you through the same struggles and victories. Ask questions, get solutions, share successes, vent about life, and post your completed challenges to get encouragement and added motivation! You’ll get complete access to all of the audios and worksheets forever so you won’t get behind and you can come back to them any time you need. 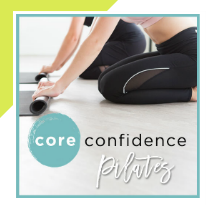 Enjoy the benefits of Pilates with lifetime access to Danielle’s Core Confidence Online Pilates studio. Core Confidence contains a library over 50 Pilates videos with expert instruction. Choose from 10, 20 or 30-minute sessions. Pilates helps build your confidence and core strength while you connect deeper with your body. Getting to the core of emotional eating requires you to get comfortable feeling and processing the emotions that you’ve been trying to avoid. It involves accepting and allowing these emotions to move through you, and understanding that they are a big part of your internal guidance system, there to show you something you need to see. In this special module Heather shows you how to process through your thoughts and beliefs with compassion and self love. PLUS – a live Q&A session with Heather to answer any questions you have about the process or to get personal coaching on an issue you’re having. 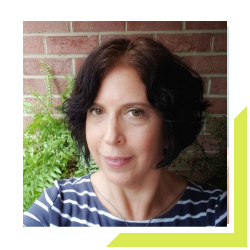 Bridgitte Carroll is an Integrative & Functional Dietitian specializing in controlling autoimmune conditions, balancing hormones, and managing stress. As women, we are super sensitive to imbalances and shifts in our hormones that affect how we think, sleep, breathe and react to life. Learn how to get your body back into hormonal balance and support yourself at a cellular level with this special training. PLUS — a live Q&A session with Bridgitte to get all your hormone questions answered and troubleshoot any problems you might be having. Understanding when you’re out of alignment (and knowing what to do about it) is the key to transforming our life experiences. 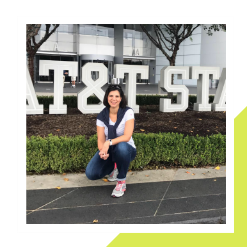 Join Motivational Speaker Mina Fies as she shares her journey of learning to use flow as her personal guidance system to propel her personal and professional growth. Learn how to identify when you’re out of flow, how to get back into ease and grace, and the secret to uncovering ease and flow in others. The program is broken down into bite-sized monthly modules. With access to daily coaching, on-the-spot advice, and a dose of inspiration when you need it, you’ll be well on your way to mastering the areas of your life that you know need more balance. Nourish for Life gives you the time and support you need to live with your new mindset, new attitude, and new habits and to problem-solve any obstacles and challenges along the way. This program is a commitment that we are making to each other. We are changing your relationship with food and your body as well as your lifestyle. In December, we will get all your nutrition ducks in a row. You will get to know everyone in the group, meet your accountability partner, and begin the work of creating a strong foundation. We kick off the program with a lesson on what it means to be a conscious eater. Conscious eating is what Nourish For Life is all about. It’s about being grounded in a reverence for feeling good in your body, no matter what. It involves choosing your food from a conscious place, while recognizing old belief patterns and responding with compassion. Begin the fundamental work of your Nourish Blueprint. Learn what’s been stopping you from sticking to a program in the past. We will uncover your true motivation for getting healthy and learn simple strategies for accessing it in the moment, exactly when you need it. Once you’re ready to take consistent action, you’ll shift your focus from WHY you want to change to HOW you’re going to change. Your action plan is a personal contract that lays out exactly what actions you are committing to taking to bring your desires to life. Unlike goals and desires, your principles are not what you wish to do, want to be, or aspire to have. Your food principles are who you are – they are the guiding principles around how you you eat. They fully encompass your desires, your motivation, and your goals. Getting to the core of emotional eating requires you to get comfortable feeling and processing the emotions that you’ve been trying to avoid. It involves accepting and allowing these emotions to move through you, and understanding that they are a big part of your internal guidance system, there to show you something you need to see. In this module we welcome special guest expert Heather K. Jones and begin the work of learning how to process through our thoughts and beliefs with compassion. Staying in alignment with your goals may seem like hard work, but once you learn how and why you get out of it, it’s much easier to get back in. Understanding when you’re out of alignment (and knowing what to do about it) is the key to transforming our life experiences. 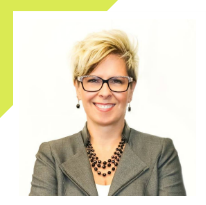 Join Motivational Speaker Mina Fies as she shares her journey of learning to use flow as her personal guidance system to propel her personal and professional growth. As women, we are super sensitive to imbalances and shifts in our hormones that affect how we think, sleep, breathe and react to life. Get your body back into hormonal balance with this special 2-part training with Expert Guest Integrative & Functional Dietitian Bridgitte Carroll. You’ve been shown you where you need to grow, where you still need to reframe your thinking, and how important it is to make food decisions that reflect this new you. You are becoming more and more aware of how awesome it feels to make food decisions that truly align with your goals. You’ve proven that most goals can be met when desire and motivation meet action and accountability. Now it’s time to bring it all together! This is soooo much more than just figuring out how to lose weight. YOU’LL ACHIEVE A BODY WEIGHT THAT’S RIGHT FOR YOU AND LEARN HOW TO EAT HEALTHY FOR LIFE. I’ll be right beside you throughout the year sharing my insights and giving you support in real time. You’ll get to see firsthand how I shop, cook, and eat. You’ll get daily interaction with me through scheduled Facebook Live broadcasts and posts in the private Facebook group. I am a registered dietitian, clean-eating coach, author and passionate nutrition educator. 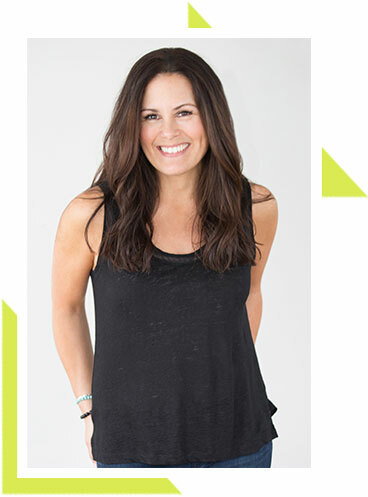 I founded Danielle Omar Nutrition to support busy people on their journey to better health. I am an avid cook, and enjoy sharing plant-based recipes and nutrition strategies on my blog. My work has appeared in Washington Post, The New York Times, The Washingtonian, Men’s Health, Shape Magazine, and Women’s Health Magazine. Through my private nutrition practice, media appearances and online programs, I have successfully motivated thousands of people to eat confidently and live healthier lives. Is Nourish For Life Right For You? You’re ready to upgrade your diet and your health and you’re ready to stop dieting…forever. You already know a lot about eating healthy, but you don’t know how to implement it. You’re ready to uncover your emotional eating triggers and burn up false beliefs. You’re ready to give up trying to eat “perfectly”. You want a body you feel good in and you’re ready to make it happen. You want the best for your own health and also for your family. You want to feel confident in your food choices whether on vacation, eating out, during holidays, or when life gets stressful. You’re pretty happy with their general health, weight and energy level. You don’t need long-term support to break unhelpful eating habits. Committing long term is not your cup of tea (If this sounds like you, my 21 Day Nourish program might be better suited for where you are right now). Don’t feel comfortable in a group program. 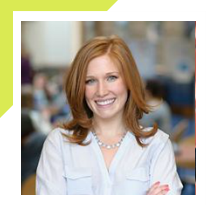 Danielle has created a community that is a click away when you need support and this almost instant feedback is often the difference between giving up (again) and working through the issue. 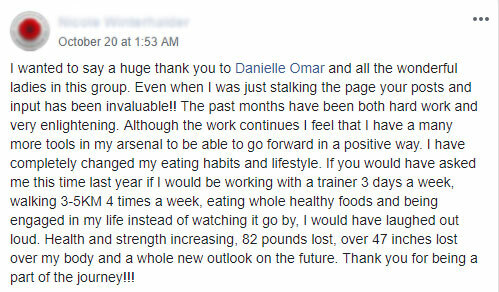 After 40+ years of struggling with my weight, believing food was the enemy and that if I could just stop eating X that I would be happy, I found Danielle and Nourish For Life. Since starting NFL I have lost weight and reduced my blood pressure, but I feel that these are side effects. What I have lost is my false beliefs about how food affects me and what I have gained is a knowledge about how to have a healthy relationship with food. Danielle has created a community that is a click away when you need support and this almost instant feedback is often the difference between giving up (again) and working through the issue. 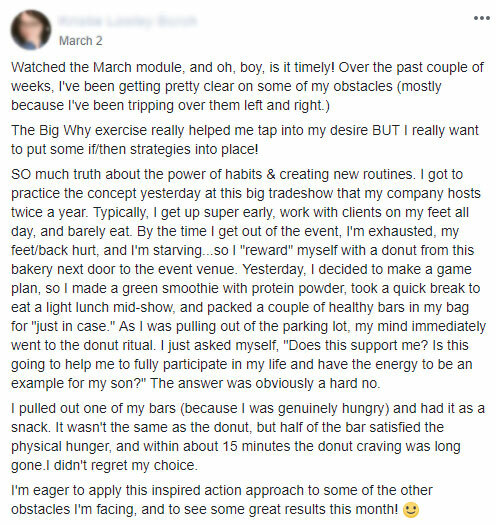 Although the food is a central part of the program Danielle puts an emphasis on changing behavior, having us look at our reactions to food and digging deep to find the “whys” in our actions. She also is helping to create lifestyle changes that are sustainable — not just a new “diet” or quick fix. In 8 months my relationship with food has changed from a battle to find the perfect diet to a balance where I understand and honor my choices. I enjoy eating again as every meal is not “good or bad” but just what it is: a meal. For the first time in my adult life I feel I have found something that is sustainable for life and Danielle and NFL have made that possible. In the past 7 months I’ve lost 18lbs and only have 8lbs more to reach my goal! Nourish for Life has helped me look at my current eating habits and create new doable, everyday ones that align with how I want to eat going forward. Now I realize what “healthy/clean” eating can look like. At the start of the program I wanted to accomplish two main goals 1) make healthy/clean eating part of my everyday life and 2) lose weight. In the past 7 months I’ve lost 18lbs and only have 8lbs more to reach my goal! Nourish for Life has helped me look at my current eating habits and create new doable, everyday ones that align with how I want to eat going forward. I also now have the tools to work through when “life happens” and I fall back into old me and old eating patterns. I’ve developed awareness about my cravings and negative self-talk that can sabotage me. I’m motivated more than I’ve ever been and feel so much better about myself and what I’m able to accomplish. Signing-up for the Nourish for Life program has been one of the best self-care decisions I’ve made for myself! 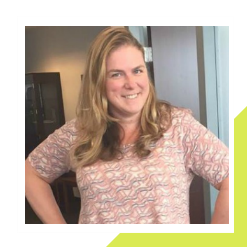 As a coach Danielle is very approachable and her knowledge and support through this program and learning process has been first-rate. Thank you Danielle for all your hard work! Having dealt with weight gain/loss my whole adult life, I now feel free of that cycle. I have gone from minimal (and despising) meal planning to planning, prepping on a weekly basis. The biggest result that I’ve seen is the ability to get back on track and set myself up for a good week. This is a big change from beating myself up and allowing that negativity to impact my eating. The support from Danielle and the NFL community has been a really positive and key part of the program. The posts and insights have spurred my own ‘a-ha’ moments, at my own pace. 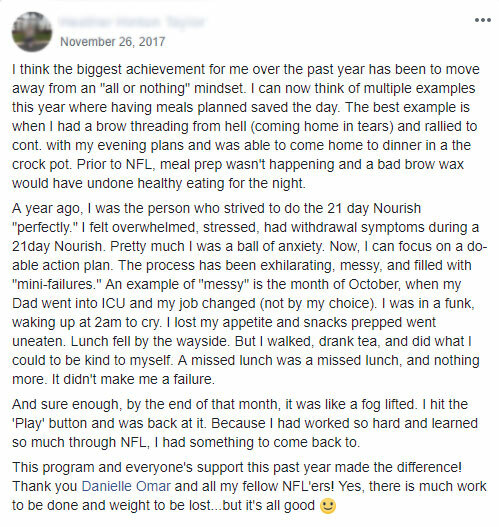 After completing Nourish for Life, I’ve been able to dump anxious/negative thoughts surrounding food and eating for good! Having dealt with weight gain/loss my whole adult life, I now feel free of that cycle. I’ve upped my vegetables and cut unhealthy snacking. I found an old receipt while I was cleaning out a purse recently. The receipt had multiple bags for Goldfish crackers and a few other things. I thought, why on earth was I buying three bags of crackers? Because the crackers were on sale? Now I wouldn’t consider three bags of any processed food to be a good deal! Nourish for Life is not a diet program. It’s about learning how to nourish your body for optimum health. Other than teaching you how to stay within your calorie budget, I won’t be prescribing what you should be eating and when you should be eating it. Rather, I’ll be supporting and guiding you to make the right food choices in your day-to-day life. You’ll receive a cookbook each week packed with healthy Nourish-inspired recipes, which you can use as inspiration to plan out your meals. As we get into the program you’ll learn what types of food and how much are right for YOUR body. Do I need to be a computer whiz to do this program? No way! As long as you have access to the Internet, have an email account and can view videos and audios on a laptop, tablet or smartphone, you’ll have no problem. The membership website is very easy to use and you’ll get all the support you need to access the materials. If you’d like to participate in the closed Facebook group you will need a personal Facebook account, but this is entirely optional. How much time will I need to devote each month to the program? You know you need to invest in yourself and take action, but I know that you also have a life! Nourish for Life is designed to fit seamlessly into your busy lifestyle, no stress or having to keep up. You can put into it as much or as little as you want, knowing that you’ll get out only what you put in. I recommend setting aside 30 minutes per week to focus on meal planning and another 30 minutes per week engaging with the online community. I’ve tried other online challenges and programs that didn’t work. What makes this one so different? Nourish for Life is an extension of my popular 21 Day Nourish program. It’s designed to take you through each month of the program focusing on different aspects of your life. What really sets Nourish for Life apart from most other health and weight loss programs out there is that you are fully supported by myself, your accountability partner, and the other amazing participants throughout the entire 10 months. You’re never left to struggle through it alone. You’ll learn the skills you need to nourish your body for life. You can pay via credit card or PayPal. A payment plan is available if you prefer at a slightly higher rate. Please note that if you select to pay via payment plan, payments must be kept up to date to continue access in the program. If your automatic payment fails you may be excluded from the program until the outstanding payment is received. I have a health/medical concern. Can I still participate? Yes. As a registered dietitian I am trained to work with various health conditions and chronic diseases. To maximize your results and get the personalized attention you need, consider upgrading to the individual counselling sessions to get 1:1 support. If you have questions, get in touch via email and we’ll go over your specific circumstances and address any concerns you may have. Not to worry – you will have access to the educational modules for the life of the program! Will this program work for any age group? Yes! You’ll be learning what works for YOUR body, eating good whole food meals and learning how to make the right food and exercise choices for YOU. This is much more than a program; it’s a way of living, which is why it works for all ages, body types and fitness levels. Can my husband or partner do this program with me? Membership to this program is restricted to women only. However, your husband will certainly benefit from what you’ll be learning along the way. The recipes you’ll receive each week are absolutely delicious and can be adapted to suit the whole family. But this is your time; this is about taking care of your health and learning how to nourish YOUR own body, for life. I’m still not sure if this is right for me, can I contact you? I always make myself available to answer all of your questions so you can feel 100% confident this is a good investment for you. Click here to get in touch! Ready to get Nourished for Life?